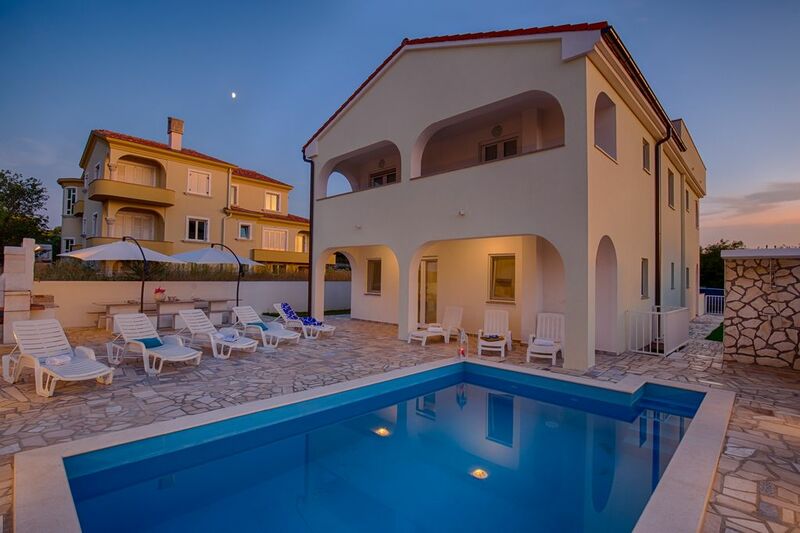 This newly built Villa Mata is located in a tourist resort of Malinska, on the island of Krk, near the beach and many sights, but in a quiet area with a view of the sea. The total area of ​​the villa is 300 m2 and has 6 bedrooms, 6 bathrooms and a separate toilet. The rooms are very comfortable, each room has 20 square meters and a private bathroom. Two rooms have a large double bed and an additional single bed and four rooms have large double beds. Villa Mata can accommodate a total of up to 14 people. On the ground floor is a spacious living room and a fully equipped kitchen (fridge with freezer, toaster, microwave, oven) and a bedroom, bathroom and a toilet. Upstairs there are five bedrooms and five bathrooms. From the living room you come to the beautiful terrace with sun deck, which is equipped with a shower, sun umbrellas, deck chairs, barbecue and a table with chairs. The nearest shop is 400 meters, the nearest restaurant is 700 meters and the nearest beach is only 900 meters from the villa. Malinska is a holiday resort on the island of Krk, which offers many beautiful beaches, good restaurants and pubs and many sights, and in the evening you can enjoy long walks along the coast. Villa Mata is definitely an excellent choice not only for those who want to spend a relaxing holiday with family and friends but also for those who want to enjoy a good time and sights. We can only recommend this villa, all new, extra clean, nice position near the sea. Alla sovrum har eget badrum, bra kök, diskmaskin, tvättmaskin. Bassängen var uppskattad hos barnen. Ca 15 min promenad till havet och centrum. Nära till andra utflyktsmål om man har bil. En jättetrevlig och gästvänlig ägare. Sehr schönes Haus und tolle Zimmer es ist alles da was man braucht. Huset var jättebra, perfekt för vår stora familj. Bra uteplats med grill. Perfekt med egen pool. Hjälpsamma och snälla ägare. Gångavstånd till hav och mataffär. Dock inga trottoarer så man går på bilväg. Inte helt enkelt med barn. Tänk på att det är uppförsbacke hela vägen hem. Bra att ta med vagn till de mindre barnen. Hade en jättebra vecka och rekommenderar andra att åka dit. Das Haus bietet alles, was für einen erholsamen Urlaub benötigt wird. Obwohl wir vor der Check-In Zeit angekommen sind, war dies für die Vermieter Herr Bratic und Frau Subat kein problem. Der Administraive Teil wurde schnell und seriös erledigt. Uns wurde sogar noch der Weg zum Strand und Einkaufsmöglichkeiten gezeigt. Alle Zimmer sind modern eingerichtet, sind sauber und haben ein eigenes Bad. In den Zimmern kann man sich richtig wohl fühlen. Diese Villa kann nur weiterempfohlen werden. und danke fur Ihre Bewertung. Vielen Dank fur wahlen unserer Villa fur Ihrem Urlaub.